A group of around nine parents and students on Wednesday took over a classroom at a Humboldt Park school slated to close under a controversial Chicago Public School plan to shutter dozens of underperforming schools. The sit-in style protest started around 2:45 p.m. at the end of the school day at Lafayette Elementary located at 2714 Augusta Boulevard, according to freelance reporter Micah Uetricht from Jacobin Magazine who was on the scene and is taking photos of the protest. 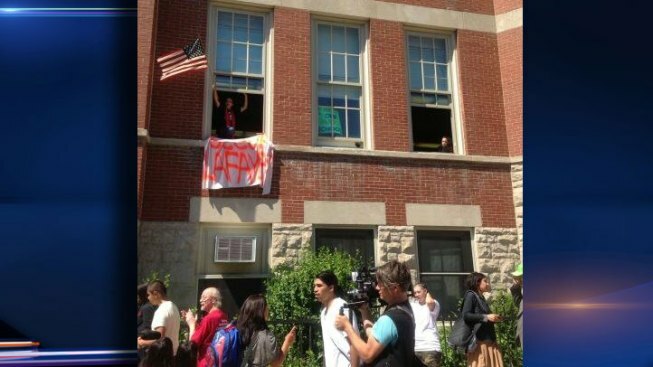 The protestors, who have labeled themselves "Occupy Lafayette," hung signs from the windows of the classroom. One person could be seen waving an American flag. According to a news release issued by the group, the group demanded "Mayor Rahm Emanuel and his handpicked Chicago Board of Education reverse the school's closing." Teachers and students share memories on the last day of class for more than two dozen closing Chicago schools. Michelle Relerford reports. 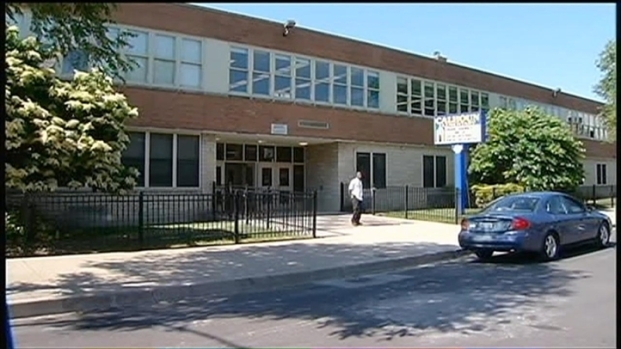 Students from Lafayette are scheduled to attend Chopin Elementary in the next school year. An additional 40 to 50 people, including many students, were protesting outside the school, chanting slogans and blocking access to a truck where individuals were trying to load items from inside the building, according to Uetricht. Students were also seen playing musical instruments, an ode to the school's lauded music program. Twitter photos show police officers inside the classroom and at least one child in a stroller inside the classroom. CPS officials told NBC 5 that this is the only incident like this and that "everything was quiet and peaceful at the other schools." "Lafayette is one of the schools that people were most bitter about. The parents, teachers and staff at that school really felt as though the decision to close it was an illegitimate one—in the service of students and the importance of that school to the neighborhood. But the Board jammed that decision through and people are determined to be heard. School closings hurt students and destabilize communities. The parents who are currently engaged in this non-violent protest are heroes and they are fighting in the best interest of their children." Those involved in the protest were escorted out of the building by police during the 6 p.m. hour. "Our hope is for Barbara Byrd Bennett to get the point that she is hurting families. That she is hurting families to the point that we are desperate enough to do what is needed," said parent Rosemary Vega. "They might have closed our doors, but they didn't shut us down. We are still going to fight." The first wave of schools marked to close shut their doors Wednesday as part of a plan approved last month by the city's Board of Education. In total, the final bell rung at 28 schools Wednesday. Last week, more than 850 Chicago Public Schools teachers and staffers at closing and turnaround schools were laid off. Up to 420 teachers from closing schools received pink slips, along with 110 teacher assistants and 133 bus aides and part-time seasonal employees.